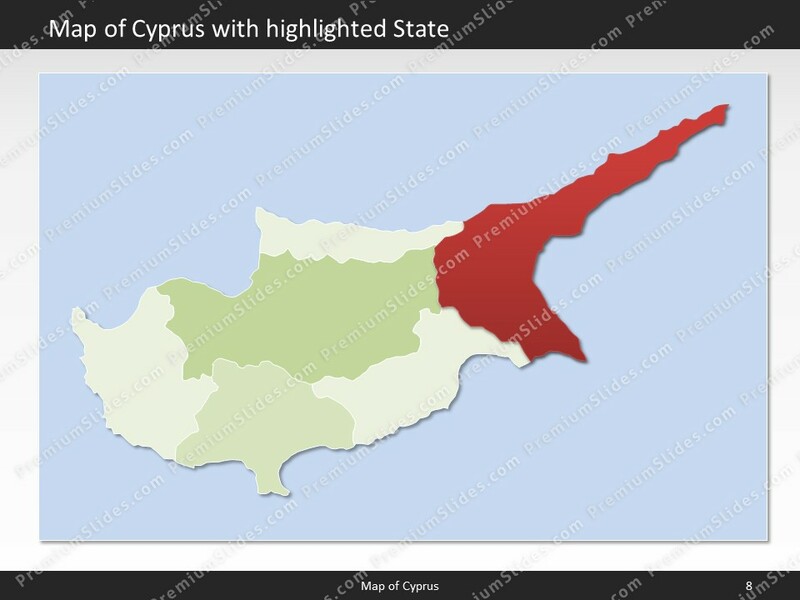 Premium PowerPoint Map of Cyprus. 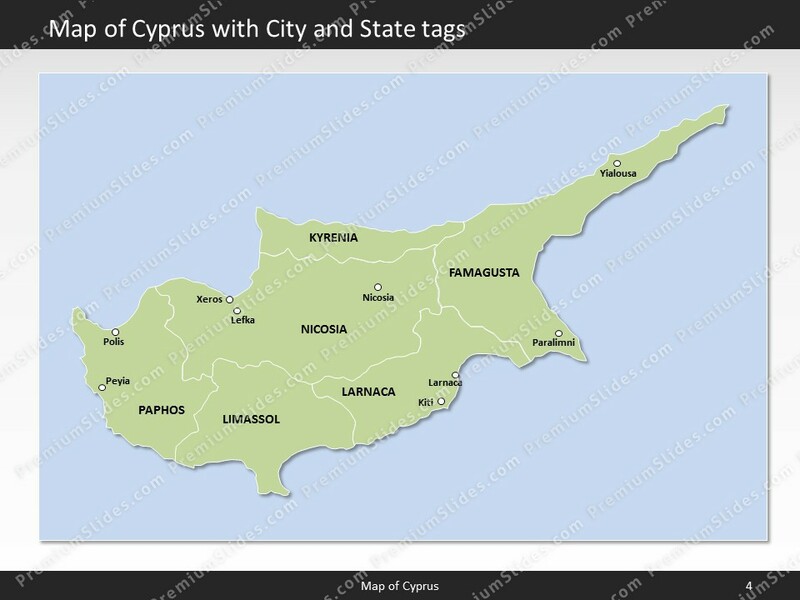 This detailed PowerPoint Map Template shows Cyprus states, biggest cities and the Cyprus state capital. 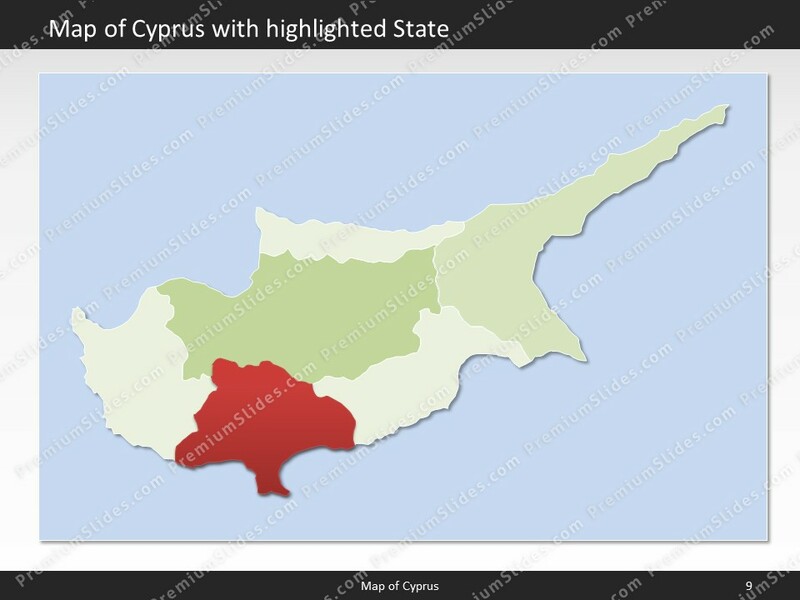 The Cyprus PowerPoint Map is hand drawn and fully editable in size and color. 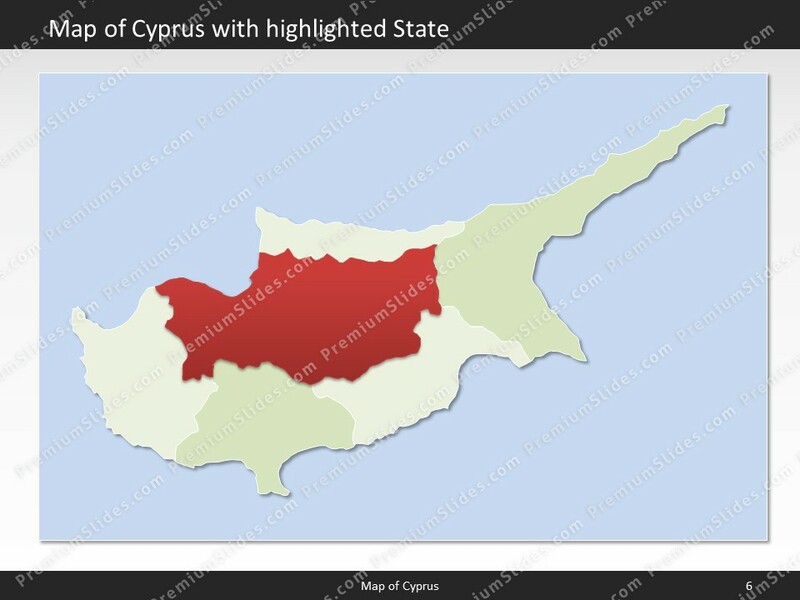 Premium PowerPoint Map of Cyprus. 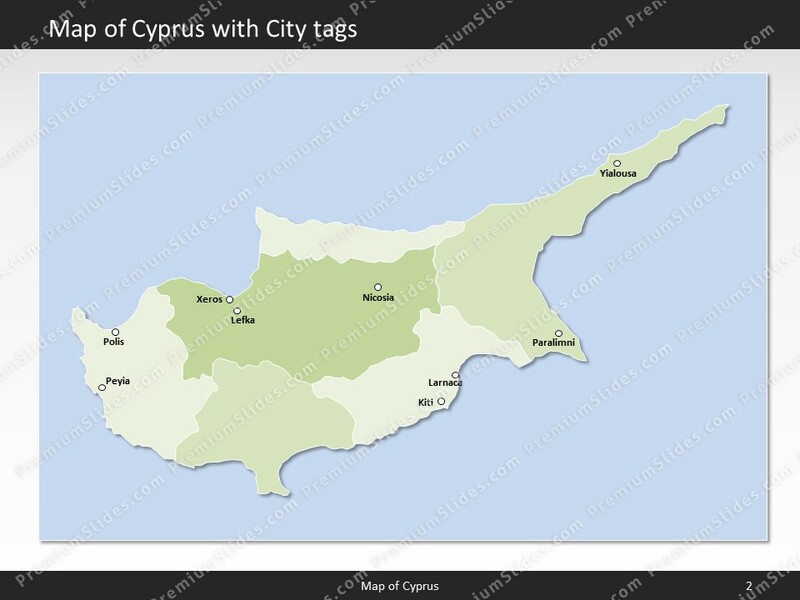 This detailed PowerPoint Map Template shows Cyprus with states names and biggest cities including the Cyprus capital.The Cyprus PowerPoint Map is hand drawn and fully editable in size and color. Every state can be extracted simply. These exceptionally detailed PowerPoint maps are completely editable in size and color. Each country, county or state (depending on the map) can be extracted or highlighted. Because of the top quality you can resize any map without any loss of quality. This is important if you want to print your PowerPoint Slides. 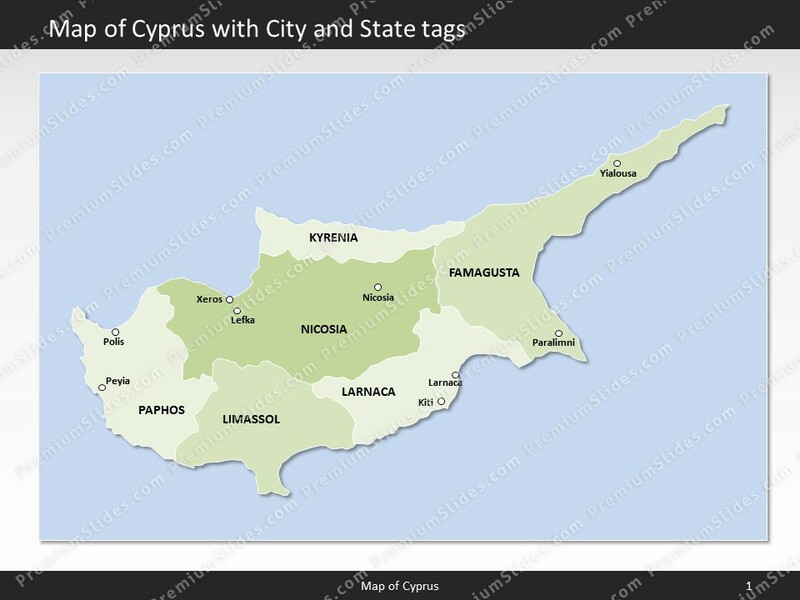 Facts and information about Cyprus you can use in your presentation. 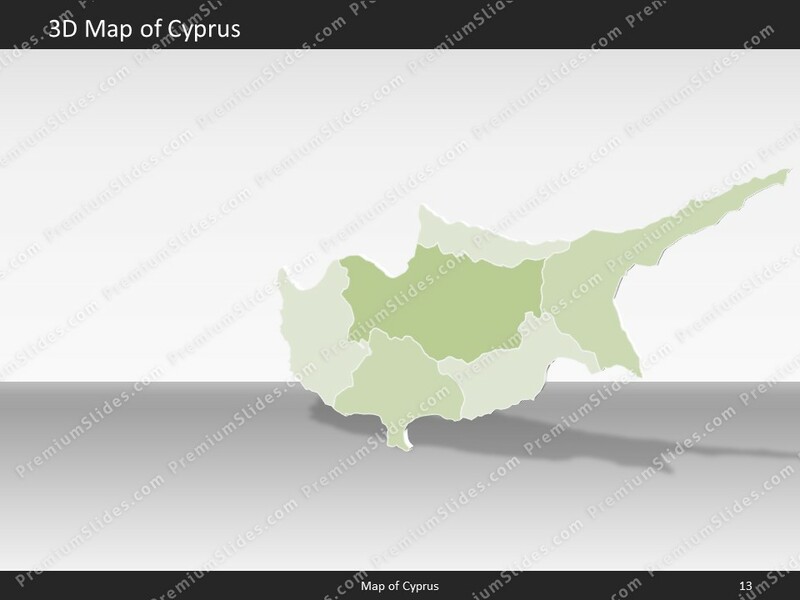 Cyprus is often referred to as Republic of Cyprus or simply Cyprus. The locals also call the country Kypriaki Dimokratia/Kibris Cumhuriyeti or Kypros/Kibris for short. The derivation of the name "Cyprus" is unknown, but the extensive mining of copper metal on the island in antiquity gave rise to the Latin word "cuprum" for copper. The country's flag has the colors blue, white. 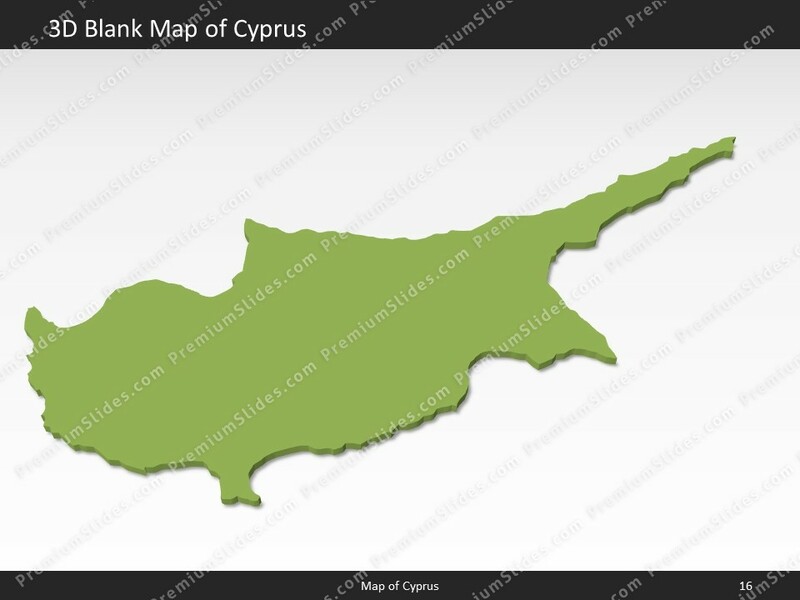 The country of Cyprus lies 35 00 north and 33 00 east. 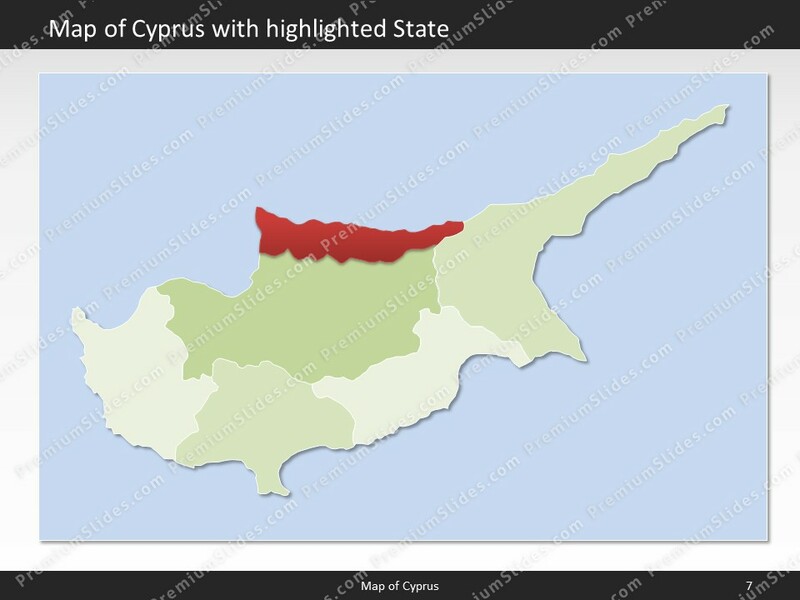 The region has a total area of 9,251 sq km (of which 3,355 sq km are in north Cyprus) with a land coverage of 9,241 sq km. About 10 sq km is covered with water. 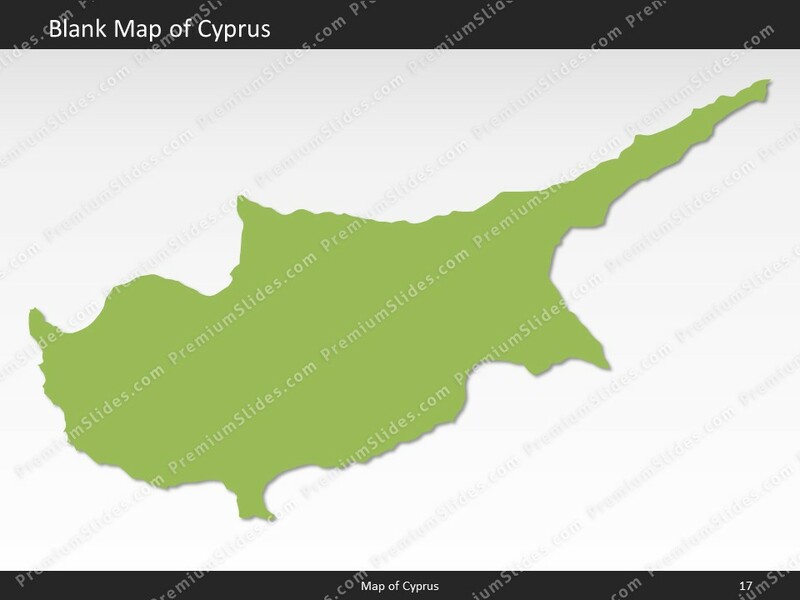 Cyprus has a total border lenght of 156 km and is bordered by the following 0 countries: 0. The lowest point is Mediterranean Sea 0 m below sea level and the highest is Mount Olympus 1,951 m. Its mean elevation is about 91 m. Nicosia (Lefkosia/Lefkosa) is the capital of Cyprus and can be found 35 10 N, 33 22 E.
In July 2016 Cyprus had a population of 1,205,575 people. In 2015, 66.9% of the population lived in cities. The annual growth rate of urbanization is 0.89%. 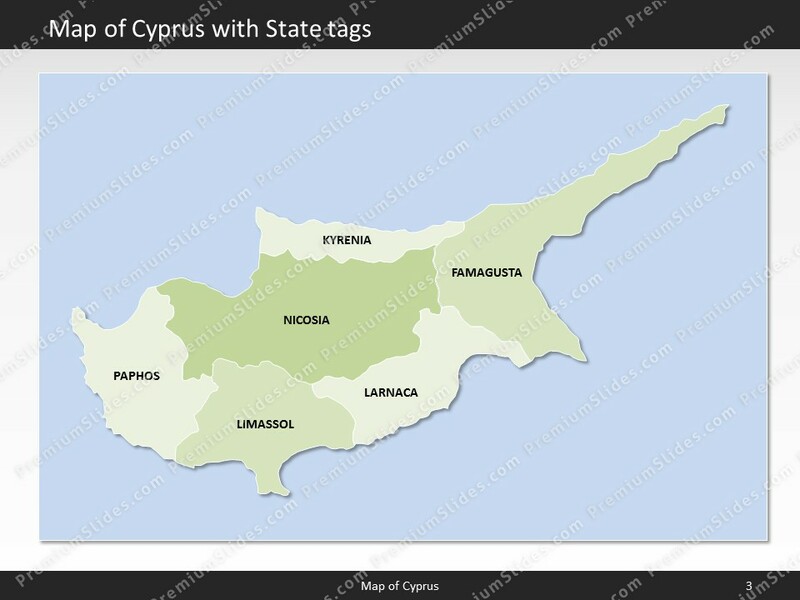 The residents of the country are called Cypriot(s). The Cypriot population has a median age of 36.4 years. The median age for males in 2016 was 35.1 years, and 38 years for females. The estimated growth rate of the Cypriot population in 2016 was 1.38%. Looking at life expectancy, the Cypriot people live an average of 78.7 years (males 75.8 years, females 81.6 years). Statistically, Cypriot women give birth to 1.47 children in their lifetime. The estimated gross domestic product in 2015 was about $28.06 billion, with a growth rate of 1.6% compared to 2014 (GPD 2014: $27.62 billion, growth rate -2.5%; GPD 2013: $28.33 billion, growth rate -5.9%). The economic sectors of Cyprus are: agriculture: 2.1%, industry: 10.3% and services: 87.4% (2014 est.). The country's economy is known for: tourism, food and beverage processing, cement and gypsum, ship repair and refurbishment, textiles, light chemicals, metal products, wood, paper, stone and clay products. 100% of the people living in Cyprus had full access to electricity in 2016. Among those 71.7% (July 2015 est.) or 853000 Cypriots, had access to an internet connection.